Who will come when help is needed? Usually fire brigades, police officers or paramedics. Nevertheless, what if these helpers can’t find a way to reach people after earthquakes, floods or other life-threatening situations? In the next few years, more drones could then be deployed for humanitarian aid. The technological development of the missiles gives hope that in crisis areas there will soon be a new possibility of assistance. The first droning corridor was recently opened in the African Malawi. Likewise, there have been successful operations in various disaster areas, for example after the devastating typhoon “Haiyan” in the Philippines. In addition, even in Europe, drones are already in use as a rescuer. In the field of private use, comrades in particular are known which are used for video recordings. The devices are comparatively easy to operate, very variable in flight and equipped with a lot of technology in a narrow space, for example with a high-resolution optics. The precise air photographs, on which streets, cars and even people are clearly visible, are precisely detailed. In this respect, they are predestined for the search for victims and the cartography in disaster areas. The idea of using video dubbing not only for the digital holiday album, but also for auxiliary purposes was not far off. Therefore, it came that the small fliers in November of 2013 to one of their first large relief missions. The target area then: the Philippines. The typhoon Haiyan, one of the strongest hurricanes ever measured, made over four million people homeless in the provinces of Leyte and Samar. International rescue teams were on site quickly, but the situation presented them with numerous challenges. One of the biggest problems was the unknown terrain. Although maps and records existed, because of the immense force of the natural catastrophe, the old infrastructure in the particularly affected areas was destroyed. Some organizations had fortunately provided for this case and specialized drones in their luggage. The small aircraft delivered usable video material immediately, with which current maps could be created in two-dimensional and even three-dimensional representation. As a result, the helpers received a precise overview of the situation on the ground. A circumstance that led to rapid aid measures. A particular advantage was that all relevant information could be bundled in a crisis center so that effective coordination of the rescue operations was possible from there. The high-resolution images even made it possible to locate individual victims and provide them with specific help. It is obvious that many human lives could be saved along this path. The use of real-time aerial photography for humanitarian operations such as the Philippines is not fundamentally new – helicopters are used for similar purposes. However, what is new is to be able to provide the savers with an easy-to-operate and cost-effective aircraft. Even the logistics of the deployment planning is considerably simplified if several reconnaissance drones are brought directly to the site of the aircraft, instead of bringing together helicopters from all parts of the country. In particular, the rescue helicopters can then perform their core task: to free people from emergencies. The air reconnaissance is also taken over by the relief organizations’ staff. These in turn benefit from the favorable acquisition costs of unmanned small aircraft, which are likely to continue to fall due to the high demand worldwide for private video rigs. Money, which had previously been spent on a helicopter with crew, now allows the purchase of numerous rescue drones. Finally yet importantly, the enormous flexibility and variability of the aircraft are two decisive advantages. A compact built-up comrade moves safely and precisely in the mountains, in destroyed cities or in narrow streets. There doesn’t not always have to be a flood, an earthquake or a hurricane to make drones meaningful. An example of a long-term humanitarian response is the Malawi drone corridor. It is about the construction of a favorable and flexible infrastructure, with which private operators and public institutions want to provide people in remote regions. The interest of twelve organizations and companies alone shows that this project is already more than a beautiful fiction for the future. The concrete objective of the project is to explore the possibilities of drones and to combine this with a practical benefit for the indigenous population. Therefore, in the sky of Kasungu, the place where it is deployed, it looks a little like in Cambridge, where Amazon’s “Prime Air” tests: always start small flying objects. However, while the transport drones are shipping packages in the western countries, they have medicines and blood tests in southeast Africa. This shows once again that the research technologies, initially designed for a completely different field, have produced a great benefit for the people in need. Because without the demand for baggage drones in Europe and the USA, there would be no small medicine racers in Africa. Perspectively, the unmanned helper will be able to do much more. It is planned, for example, to equip the aircraft with relay stations for the radio network. Thus, a provisional mobile phone reception could be established if the necessary infrastructure had been destroyed. Christopher Fabian, the innovation leader at UNICEF, sees a special benefit for the youngest inhabitants of the region. For example, unmanned aviators collected blood samples from children from inaccessible villages and settlements, which were sent to a laboratory for analysis. In the case of an infection, the doctors were able to send back the appropriate medicine quickly. The use of drones only in the case of bad roads or roads is a fallacy. Even in areas known for fun and recreation, the aircraft can save lives. These are the beaches in Spain and France, which attract several million tourists each year. With so many visitors, unfortunately, it happens repeatedly, that bathers are overbearing or suffer a weakness in the water – a classic case for the rescue floats. Parallel to humans on some beaches now also a drone, naturally painted in the classic Baywatch red to help. Within a few seconds, the pilot is on site and can throw a rescue vest. In addition, the video function allows a precise positioning of the victims. The camera even surpasses the human eye. Equipped with a thermal imaging function, the drone detects drowning people who are no longer on the water surface. Why are unmanned flying objects so practical for Rescue Missions? Some of the major advantages of drones have already been mentioned: they are cheap to buy, flexible to use and easy to use. In addition, there is another positive aspect: not anyone who controls a drone from a safe base from a base camp puts himself at risk. Unmanned flying objects can therefore also be used where environmental conditions prohibit the sending of human helpers. This is mainly due to fabricated accidents where chemicals or radioactive substances are released. Although the technology would have to defy the adverse conditions, this seems however in an emergency rather than risking human life. Of course, nobody wants accidents or catastrophes, but in the case of drones, there is a certain soothing security. This applies not only to those who are potentially affected, but also to firefighters, doctors and all other personnel who can rely on the automatic helpers. For all drones, the psychological effect on people in need is not to be underestimated. Resignation can become a great danger in many catastrophes. However, as soon as people in distress, in the ruins of an earthquake region, or on a hill surrounded by floods, see a drone, they know that we have not been given up. This psychological effect can once again release the power of persevering until the rescuers arrive. Will the drone of the future Substitute the superhero ? The support of helpers after natural catastrophes, humanitarian aid in Africa and the rescue droids are only three examples of the possibilities of unmanned drones for people in need. Many other areas of application are conceivable, for example in the case of mountain rescue, after accidents or in the search for missing persons. Similarly, people who have been cut off from the outside world by natural catastrophes or wars could be provided with relief supplies. The first successes of the new technology show that such measures can be implemented more intensively in the future. An important prerequisite for this is the technical development of the unmanned aircraft. Difficulties still exist, for example, in terms of reach and transport capacity. Food and water are so heavy that the small appliances in any significant amount cannot transport them. The ambitions of Western online retailers have the potential to remedy this situation. 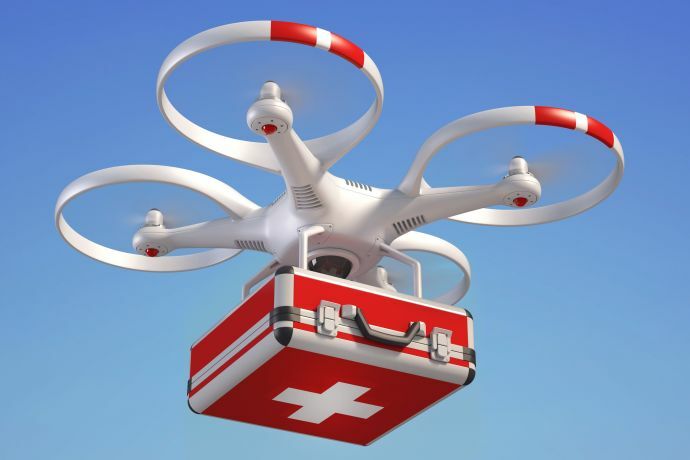 If you want to get books, electronic articles and maybe even food from the dealer to the customer with drones, the technical solutions for humanitarian aid would be very interesting. In terms of reach, drones are likely to benefit from another industry. Manufacturers of smartphones and electric cars invest a lot of research into the development of improved batteries and batteries. More stored power would mean a greater radius of deployment for drones. In Malawi, this is currently limited to 40 kilometers. In any case, private demand will play a decisive role. Only because drones are as popular as “toys” is the use of aid organizations at all affordable. For people in Africa, after hurricanes or other accidents, it is to be hoped that the development will proceed as fast as it has been in recent years.